Let Fleet Feet Montclair & New Balance coaches help get you race-ready for the cross country season! Sponsored by New Balance, this FREE program is perfect for high school cross country athletes gearing up for the fall season. 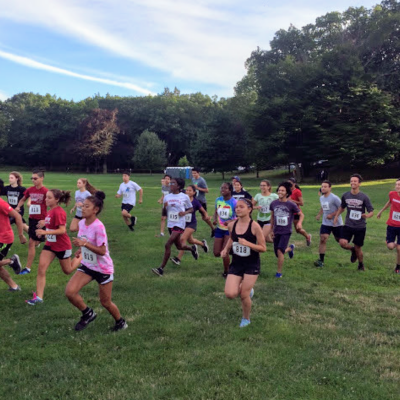 It's a great opportunity to build a base and become familiar with the Essex County XC course. Join us for this non-competitive, relaxed program offering runners the chance to perfect skills, meet other local runners and learn about running related topics (i.e. good form, pacing techniques, etc.). Brookdale Park Cross Country Course - We meet near scoreboard at base of track. "Most Dedicated Team" Award (Bloomfield High School 2018). The team who shows consistent attendance and dedication throughout the program will receive tech shirts donated by New Balance. Whether you come once or to all four sessions all athletes MUST complete a waiver. It's easy and doesn't take long ... complete the waiver ahead of time by registering on-line and then "check in" at each session. Simple! Description: Sponsored by New Balance, this FREE program is perfect for high school cross country athletes gearing up for the fall season. It's a great opportunity to build a base and become familiar with the Essex County XC course. Join us for this non-competitive, relaxed program offering runners the chance to perfect skills, meet other local runners and learn about running related topics (i.e. nutrition, hydration, form, etc.). Lots of fun, lots of swag, lots of quality information and lots of good running! Please complete our 1 time waiver!